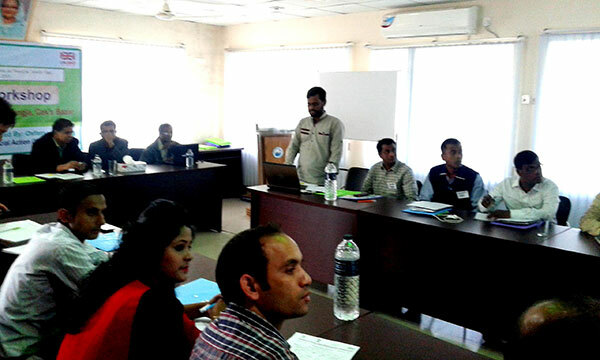 YPSA organized a Lessons Learnt Workshop on 08 December 2015 at Horticulture Conference Hall, Jhilonja, Cox’s bazaar with the support of Oxfam, funded by DFID. The main objective of the workshop was to identify key achievements, learning and challenges of Oxfam-YPSA RESPONSE project and develop a benchmark for Oxfam-YPSA future emergency RESPONSE programs. Mr. Palash Chowdhury, Director, Finance, YPSA; Md. Iqbal Hossain, Consortium Manager; SM Jaglul Razib, Program Officer, Oxfam and YPSA-Oxfam RESPONSE projects staff were present in the workshop. In the beginning Mr. Palash Chowdhury and SM Jaglul Razib gave welcome speech. Md. Didarul Alam, Project Manager, YPSA-RESPONSE Project gave a PowerPoint presentation regarding the project which includes process of the project implementation, gaps, challenges, learning and recommendations. Participants of the workshop worked in four groups all daylong to indentify challenges during project implementation process and analyze strategies, MMT Process, good practices and Learning. Md. Didarul Alam, PM, YPSA-RESPONSE – project, SM Jaglul Razib, Sr. Program Officer, Oxfam, Md. Awal, project officer, Oxfam, Ferdousi Akther, Project, Oxfam, facilitate the workshop and share RESPONSE project challenges, gap, achievements, weakness etc.